Calabicitas (zucchini) are fantastic on the grill or cooked with a creamy white cheese and corn in a delicate chicken broth. However, we wanted to honor National Zucchini Bread Day by using the calabacita in a delicious loaf. We know that to a diabetic, dietary constraints are a constant concern. Latinos continue to get hit hard with the chronic disease. 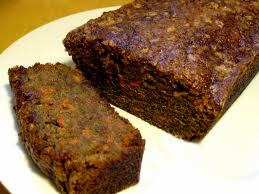 This zucchini bread is a slightly healthier version, high in fiber and low in fat and sugar. The bread is dense but stays moist with the applesauce. Like banana bread, this dish is classified as a quick bread. It’s important to note that these breads don’t use yeast as a leavening agent; there is no fermentation period so the dough can be immediately baked as soon as it’s mixed — just in time for dessert after dinner or for breakfast in the morning. Here’s a little history lesson. We learned that these “quick breads” originated here in the U.S. during the 1700s, but they didn’t become a favorite until the Civil War when food was high in demand. Rapidly made and leavened by baking soda, this satisfying loaf got its name “quick bread” during the war. Preheat oven to 350°F. Grease two regular sized loaf pans and line the bottom of the pans with parchment paper. In a large mixing bowl combine eggs, brown sugar, Splenda, apple sauce and margarine. Mix in the baking powder, baking soda, and spices. Slowly mix in the flour. You don’t want to over mix, simply incorporate. Gently fold in vegetables (and nuts). Divide batter into the two loaf pans. Bake for about 45 minutes or until a toothpick comes out clean. Cool before serving.